As a result, we receive androidrepo androidrepo file,with which we will work with the repository. For this, we indicate the rights for executable file for androidrepo. Synchronization is quite a long process, as it contains not only source code of the kernel, but also filesystem, as well as a comiler, with which both loader and kernel will be built. By the end of synchronization, we should see information about successful completion of synchronization, such as this: Syncing work tree: 100% (261/261), done. Now, before build, we should set path to the compiler, using which we will be building kernel and loader. The actual compiler is inside the repository in directory, prebuilts/gcc/linux-x86/arm/arm-eabi-4.6/bin, so we set a path to it in variable PATH. At this point, our preliminary work is complete. We build our loader, the first command distclean during first build we can skip. For u-boot build, arm-eabi-gcc compiler is used, which is already installed. Result of loader build are 2 files MLO, and u-boot.bin. Both these files are located in the root of u-boot directory. For convenience, we move them elsewhere, e.g. build build catalog. It must be noted, that omap3_beagle_android_defconfig is taken from kernel/arch/arm/configs, catalog, which is located in the kernel configuration. It is possible to change, add or select suitable configuration for specific hardware. Result of build, will end up in kernel/arch/arm/boot folder, or in our case /home/ubuntu/Adroid/source/kernel/arch/arm/boot, from where we take uImage file, that is the actual kernel, and we transfer it into the build directory, which is convenient. It takes quite a long time to build filesystem, and requires about 20Gb of diskspace. After actual filesystem build is complete, we need to obtain an archive, which will contain all the required files. 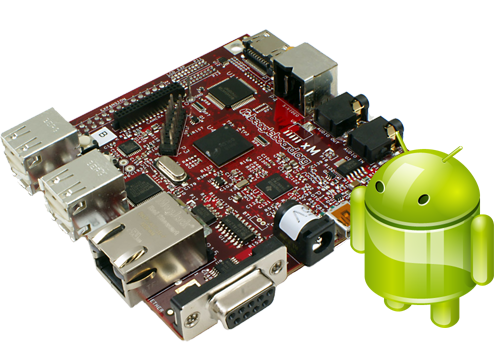 After completion of archive build, we obtain footfs.tar.bz2, which is located in out directory: /home/ubuntu/Adroid/source/out/target/product/beagleboard/rootfs.tar.bz2, And thus contains the Android filesystem. All system files are found here, applications, and utilities which are part of the operating system. That is the setting of loader's variables, i.e. we need to set screen resolution different to “by default”, thus we should change the value dvi:1024x768-16, and carry out mkbootscr. As a result, we receive boot.scr with our settings. We won't be able to modify boot.scr right away, because it carries information about control amount, which should of course, match with the actual file size. The actual board, as most devices on ARM controllers can be downloaded from NAND memory, SD/MMC или USB/RS-232. In our case, we will download with MMC. Firstly it's safer than upgrade of NAND memory, secondly, in my opinion, it's more convenient for demonstration purposes. Thus we will need MMC, preferably from 2 to 8Gb. We connect MMC to the Linux machine, and prepare the filesystem. Boot drive of MMC should contain minimum two partitions. The first, FAT16, let's call it boot, from which actual download of u-boot and operating system will take place, and second, Ext4, on which will be located our filesystem, let's call it rootfs. To simplify creation of filesystem, I prepared a small bash script, just for simplicity. If controller doesn't find the boot sector, our platform won't be able to download. echo "This script should be run as sudo user or root"
For function of script, as argument, the name of MMC device needs to be transferred, e.g. /dev/mmcblk0. Be careful with the name of the device as the actual script does not check whether it's MMC or HDD disk. After creating boot drive, we just need to correctly copy the built files. To do this, we copy the actual uImage, u-boot.bin and MLO into boot partition, as well as boot.scr configuration file. Onto second partition: rootfs, we need to extract the archive with our rootfs.tar.bz2. Our freshly built Android is ready, we disassemble our microSD, insert target device, and switch on power supply. Sometimes we need to press reset, key and the very first upload requires more time than usual. But it's a "cold start". In such way looks the process of Android build for mobile telephones and tablet computers, perhaps only deployment process on target device is different. But for debug boards such as BeagleBoard and BeagleBone etc. only device configurations vary.